No animal deserves a monument more than a dinosaur. That's why some of the weirdest, biggest, and most awesome (in the original sense of the word) statues in the world are devoted to these extinct beasts. Here are some of the most mind-boggling. 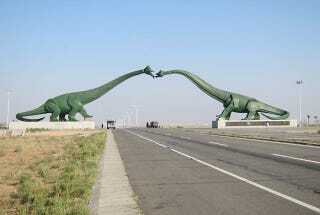 In the border town between Mongolia and China there are two Brontosauruses are kissing above the highway. You can see more of the weirdest Chinese monuments here. This isn't the only dinosaur statue in Erenhot: they have 48 of them! Lystrosaurus, the "swamp lizard" — actually a therapsid, not a dinosaur. Dimetrodon — a synapsid who lived millions of years before the dinosaurs. The statues of Lituo Landscape Science & Technology Co.